For other uses of this term, see Triple Alliance (disambiguation). Variable according to Article XIX. Some immediate, some when ratified. The Treaty of the Triple Alliance was a treaty which allied the Empire of Brazil and the Republics of Argentina and Uruguay against the Republic of Paraguay. Signed in 1865 after the outbreak of the Paraguayan War, its articles prescribed the allies' actions both during and after the war. Although the Empire of Brazil and Argentina had been traditional enemies, nevertheless, they, together with Uruguay, in 1865 united against Paraguay. The causes of the war were various, and have been hotly disputed by modern writers. But for the purposes of this article it may be enough to outline the geopolitical situation and the immediate antecedents of the Treaty. In the middle of the nineteenth century vast tracts of Latin America were undeveloped, railways were few or non-existent, and metalled roads were unknown. So river routes were immensely important, actually or potentially: in some ways, much more so than today. Of particular relevance were two of the main rivers of the River Plate basin, namely the River Paraná and the River Paraguay. There had long been disputes about the free navigation of these. For example, the governor of Buenos Aires province Juan Manuel de Rosas had blocked trade on the Paraná to put pressure on Paraguay amongst others (see Battle of Vuelta de Obligado), and Paraguay had restricted the navigation of the river Paraguay to put pressure on Brazil. Furthermore there existed immense territories which were not effectively occupied by anyone − except the aboriginal inhabitants − with no obvious or agreed international boundaries. There was a boundary dispute between Brazil and Paraguay; and there were large areas in dispute between Paraguay and Argentina, namely in the Gran Chaco and in the territory of Misiones. At that time there were no obvious and accepted principles according to which they might have been resolved, and no established practice of international arbitration. These batteries commanded the whole bend of the river, and Paraguay made all vessels anchor and ask permission before they could pass up the river. As this was the only practicable road which Brazil had to her province of Matto-Grosso [sic], she naturally disapproved of her stoppage of the river, and gradually accumulated large military stores in Matto-Grosso, with the view, no doubt, of some day destroying Humaitá. The Platine region in 1864. The shaded areas are disputed territories. Between 1854 and 1864, Paraguay built up its military forces because it thought that the outside world—Brazil, Argentina, the United States, and the British Empire in particular—was disrespecting it. In 1864, the Blanco faction of the Uruguayan War (against Brazil), short of allies, tried to lure Paraguay to its side. In November 1864 Paraguay fired upon and seized the Brazilian government ship Marqués de Olinda as it was proceeding up the Paraguay on its routine monthly voyage to the Mato Grosso. (It proved to be carrying military stores). On 14 January 1865 the Paraguayan government asked Argentina for permission to attack Brazil across the Province of Corrientes, which was refused. On 13 April Paraguayan ships fired upon and seized two Argentine naval vessels moored in the Argentine port of Corrientes and the Paraguayans proceeded to invade the province of that name. Paraguay had now made war on the much more populous Empire of Brazil; on Argentina (also more populous); and on the Colorado faction of Uruguay. The three countries had been accustomed to thinking about Paraguay as a backward upstart and were outraged. The foreign ministers met in Buenos Aires and signed the Treaty of the Triple Alliance on 1 May 1865. Francisco Otaviano the Brazilian envoy to the River Plate. In March 1865 following a change of government in Brazil the Liberal party member Francisco Otaviano de Almeida Rosa was sent on a special mission to the River Plate region. (At this stage Paraguay was at war with Brazil, but had not yet attacked Argentina.) His instructions were, amongst others, to bolster the Uruguayan government of the pro-Brazilian Venancio Flores, to see how Uruguay might cooperate in the war against Paraguay, and to stop the Argentine government making any obstacles. The Paraguayan attack on Argentine territory (13 April) precipitated the Brazil-Argentina alliance so that the 40-year old Otaviano had to negotiate its terms on the spot without specific instructions from Rio de Janeiro, there being no telegraph link with that capital. His general instructions had said that Paraguay should have to pay for the war, that the Humaitá fortifications must be destroyed in order to guarantee freedom of navigation, and that a boundary treaty must be signed with Paraguay according to certain Brazilian proposals of 1853. Argentina and Brazil were traditional enemies and the Brazilian Empire did not trust Argentine intentions in the River Plate basin. Otaviano thought the Argentine government meant to get aid from Brazil without itself assuming any obligations, so that, once the conflict was over, it could reincorporate Paraguayan territory into an Argentine-led successor to the old Viceroyalty of the River Plate. Accordingly Otaviano insisted that the Treaty of the Triple Alliance guarantee the independence of Paraguay – which did not go down well with Argentina, who insisted on receiving certain territories long in dispute between itself and Paraguay. When the Brazilian government discovered what Otaviano had negotiated − and in particular, the concessions he had made in favour of Argentina − it was not pleased; and the terms of the Treaty were strongly criticised by the Conservative opposition. The general belief in Brazil was that she did not need an alliance with Argentina in order to beat Paraguay, only that Argentina should keep out of the way. The Emperor referred the Treaty to the Section of Foreign Affairs of the Council of State. That body advised that the Treaty of the Triple Alliance was disadvantageous to Brazil in several ways, making it too easy for Argentina to annex Paraguay at some future date, and too difficult for the Brazilian navy to blockade Paraguay should that need ever arise. 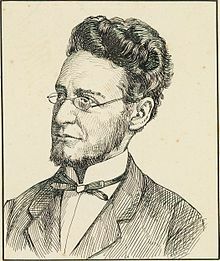 Otaviano's terms were severely criticised but he riposted that the situation in 1865 was so critical that if Argentina had wanted to take advantage of it "we would have given them twice, or three times as much". The Section of Foreign Affairs said that as it was now too late to renegotiate the Treaty, the best way out, despite what it said, was that Argentina must not obtain "a handbreadth of territory" above the Pilcomayo River. The Pilcomayo flows through the Gran Chaco into the right bank of the River Paraguay (see map), but Argentina's claim to the Chaco went far north of that, indeed according to Article XVI she was to receive territory up to Bahia Negra, near the Bolivian border. After the War of the Triple Alliance by a long-drawn out process Brazil did succeed in preventing Argentina from getting territory to the north of the Pilcomayo. Hence today that river constitutes the international boundary between the Argentine province of Formosa and the Paraguayan department of Presidente Hayes. The Treaty could not take full effect until ratification. In Argentina it was ratified by the Senate and House of Representatives in secret session on 24 May 1865, but subject to the little-known exception described in the next section of this Article and later. Instruments of ratification were exchanged between Argentina and Brazil on June 12 and between Argentina and Uruguay on June 13. The legislature of the Argentine Republic did not fully ratify Article I of the Protocol to the Treaty; this fact was kept secret until after the war. There only was not approved by the Argentine Congress the clause relating to the fortifications, and this lack of approbation, kept secret, was only communicated to Brazil long after the war. This had already been acknowledged in 1872 by the future Argentine diplomat Estanislao S. Zeballos: according to Zeballos, Article 1 of the Protocol (concerning fortifications) was rejected by the Chamber of Deputies of the Argentine Congress. It was never determined whether the Argentine legislature's refusal to ratify Article 1 of the Protocol was effective according to the law of nations or whether it was ineffective because it was not communicated to Brazil in a timely manner. Following the diplomatic usage of the era, the Treaty exists in three different versions. There are no significant differences but the sequence of passages may vary. The Treaty was celebrated (made) at Buenos Aires on 1 May 1865 and each country retained (took away) its own version. The differences were these. Language. The Argentine and Uruguayan versions were in Spanish. The Brazilian version was in Portuguese. Sequence. Each version gave prominence to its own nation, diplomatic representative and army by naming them first where possible. For example, in the Uruguayan version, Uruguay and its diplomat Dr. de Castro are mentioned before the much larger Brazil and Argentina and their representatives. As another example, in Article III (Uruguayan version) the role of the Uruguayan commander Venancio Flores is described before passing to the role of the commander of the much larger Brazilian land forces Osorio; the reverse happens in the Brazilian version. Thus a precise labelling of a particular provision might require one to say e.g. "Article III, third indent (Uruguayan version)" (as the case might be). Parliamentary paper. The British government obtained a copy of the Treaty and published it. The details of the Treaty were secret but the Uruguayan foreign secretary Dr de Castro supplied a copy to William Garrow Lettsom, the British minister at Montevideo, who on 27 June forwarded a translation of the Uruguayan version to the British Foreign Secretary Lord Russell. The British government ordered it to be printed and laid before both Houses of Parliament. It is that text that is reproduced in this Article. The Brazilian version was published in Schneider, 1902 and a downloadable version of this book is available. It does not appear that a completely accurate version of the Argentine version can be downloaded anywhere. A German language version was published in Schneider, 1872 and is downloadable. However it is not a direct translation from Portuguese or Spanish, but an indirect translation of the British parliamentary translation. The Oriental Republic of the Uruguay, His Majesty the Emperor of Brazil, and the Argentine Republic unite in offensive and defensive Alliance in the war provoked by the Government of Paraguay. The allies will contribute with all the means they can dispose of by land or on the rivers according as may be necessary. 1The operations of the war being to commence in the territory of the Argentine Republic, or on a part of Paraguayan territory bordering on the same, the command in chief and the direction of the allied armies remains entrusted to the President of the Argentine Republic, General-in-chief of its army, Brigadier-General Don Bartolomé Mitre. 2The maritime forces of the allies will be under the immediate command of Vice- Admiral Viscount de Tamandaré, Commander-in-chief of the squadron of His Majesty the Emperor of Brazil. 3The land forces of the Oriental Republic of the Uruguay, a division of the Argentine forces, and another of the Brazilian forces to be designated by their respective superior chiefs, will form an army under the immediate orders of the Provisional Governor of the Oriental Republic of the Uruguay, Brigadier-General Don Venancio Flores. 4The land forces of His Majesty the Emperor of Brazil will form an army under the immediate orders of their General-in-Chief, Brigadier Manoel Luis Osorio. 5Although the High Contracting Parties are agreed not to change the field of the operations, nevertheless in order to preserve the sovereign rights of the three nations, they do agree from this time, on the principle of reciprocity for the command in chief, in the event of those operations having to pass over to the Oriental or Brazilian territory. 1The internal military order and economy of the allied troops will depend solely on their respective chiefs. 2The pay, victuals, munitions of war, arms, clothing, equipment, and means of transport of the allied troops will be for the account of their respective States. The High Contracting Parties will afford mutually all the assistance or elements which they may have, and which the others may require, in the form to be agreed upon. The allies pledge themselves solemnly not to lay down their arms unless by common accord, nor until they have overthrown the present Government of Paraguay, nor to treat with the enemy separately, nor sign any Treaty of peace, truce, armistice, or Convention whatsoever for putting an end or suspending the war, unless by a perfect agreement of all. The war not being against the people of Paraguay, but against its Government, the Allies may admit into a Paraguayan legion all the citizens of that nation who may choose to concur to overthrow the said Government, and will furnish them with all the elements they may require, in the form and under the conditions to be agreed upon. The allies oblige themselves to respect the independence, sovereignty, and territorial integrity of the Republic of Paraguay. Consequently, the Paraguayan people may choose their Government and give to themselves the Institutions they please, not incorporating it nor asking for a Protectorate under any one of the allies as a consequence of this war. The independence, sovereignty, and territorial integrity of the Republic of Paraguay will be guaranteed collectively in conformity with the foregoing Article by the High Contracting Parties during the period of five years. It is agreed between the High Contracting Parties that the exemptions, privileges, or concessions which they may obtain from the Government of Paraguay, shall be common to all gratuitously, if they be gratuitous, and with the same compensation if they be conditional. The present Government of Paraguay being overthrown, the Allies will proceed to make the necessary arrangements with the authority constituted, to insure the free navigation of the Rivers Parana and Paraguay, in such manner that the regulations or laws of that Republic shall not obstruct, hinder nor burthen the transit and direct navigation of the merchantmen and vessels-of-war of the allied States proceeding to their respective territory, or to territory not belonging to Paraguay, and they will take suitable guarantees for the effectiveness of those arrangements, on the base that those regulations of fluvial police, whether they be for those two rivers or likewise for the River Uruguay, shall be made by common accord between the allies and such other bordering States as shall, within the terms to be agreed upon by the said allies, accept the invitation made to them. The allies reserve to themselves to concert the measures most suitable in order to guarantee peace with the Republic of Paraguay after the overthrow of the present Government. The allies will appoint in due season the Plenipotentiaries required to celebrate the arrangements, Conventions or Treaties that may have to be made with the Government that shall be established in Paraguay. 1The allies will exact from this Government payment of the expenses of the war which they have seen themselves obliged to accept, as well as reparation and indemnification for the damages and injuries caused to their public and private properties, and to the persons of their citizens, without express declaration of war, and for the damages and injuries committed subsequently in violation of the principles which govern the laws of war. 2The Oriental Republic of the Uruguay will likewise exact an indemnification proportioned to the damage and injury caused to it by the Government of Paraguay through the war into which it is forced to enter to defend its security threatened by that Government. In a special Convention shall be determined the manner and form of liquidating and paying the debt proceeding from the aforesaid causes. 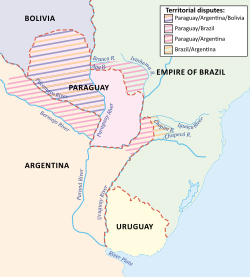 2The Argentine Republic shall be divided from the Republic of Paraguay by the Rivers Parana and Paraguay, until meeting the boundaries of the Empire of Brazil, these being on the right margin of the River Paraguay, the Bahia Negra. 3The Empire of Brazil shall be divided from the Republic of Paraguay on the side of the Parana by the first river below the Salto de las Siete Cahidas, which, according to the recent map by Manchez, is the Igurey, and from the mouth of the Igurey and its course upwards until reaching its sources. 4On the side of the left bank of the Paraguay by the River Apa from its mouth to its sources. 5In the interior from the summits of the mountain of Maracayú, the streams on the east belonging to Brazil, and those on the west to Paraguay, and drawing lines as straight as possible from the said mountain to the sources of the Apa and the Igurey. 1The allies guarantee to each other reciprocally the faithful fulfilment of the agreements, arrangements, and Treaties that are to be celebrated with the government that shall be established in Paraguay, in virtue of what is agreed upon by the present Treaty of Alliance, which shall always remain in its full force and vigour to the effect that these stipulations be respected and executed by the Republic of Paraguay. 2In order to obtain this result they do agree that, in the case that one of the High Contracting Parties should be unable to obtain from the Government of Paraguay the fulfilment of what is agreed upon, or that this Government should attempt to annul the stipulations adjusted with the Allies, the other shall employ actively their exertions to cause them to be respected. 3If these exertions should be useless, the allies will concur with all their means in order to make effective the execution of what is stipulated. This Treaty shall be kept secret until the principal object of the alliance shall be obtained. The stipulations of this Treaty which do not require legislative authorization for their ratification, shall begin to take effect so soon as they are approved by the respective Governments, and the others from the exchange of the ratifications, which shall take place within the term of forty days counted from the date of the said Treaty, or sooner, if it be possible, which shall be done in the city of Buenos Ayres. In testimony whereof, the Undersigned Plenipotentiaries of his Excellency the Provisional Governor of the Oriental Republic of the Uruguay, of His Majesty the Emperor of Brazil, and of his Excellency the President of the Argentine Republic, in virtue of our full powers, do sign this Treaty and so cause to be put thereto our seals in the city of Buenos Ayres, the 1st of May, in the year of our Lord 1865. Dr Rufino de Elizalde the Argentine foreign minister. 1. That in fulfilment of the Treaty of Alliance of this date, the fortifications of Humaitá shall be caused to be demolished, and it shall not be permitted that others of an equal nature should be erected, which might impede the faithful execution of that Treaty. 2. That it being one of the measures necessary to guarantee peace with the Government that shall be established in Paraguay not to leave arms or elements of war, those that are met with shall be divided in equal shares between the allies. 3. That the trophies and booty that may be taken from the enemy shall be divided between the allies who make the capture. 4. That the Chiefs in command of the allied armies shall concert measures to carry what is here agreed on into effect. And they signed this at Buenos Ayres on the 1st of May,1865. F. OCTAVIANO DE ALMEIDA ROSA. To this day, South America continues to debate the merits (or lack thereof) of specific treaty articles. In particular, Articles III, VI, VII, VIII, IX, XIV, and XVIII. By this article the Allies agreed to confer the overall command of the land forces on President Bartolomé Mitre of Argentina initially, even though the Brazilian military resources were much larger, mainly because the initial campaign would have to take place in Argentine territory, and then in Paraguayan territory adjoining Argentina. Because Brazil had incomparably the biggest navy, however, they agreed that command of the naval forces should be conferred initially on the Brazilian Admiral Tamandaré. The decisions, however, caused a lot of friction and dissension with the Uruguayans accusing President Mitre of being overcautious and the Argentines accusing the Brazil's navy of failing to cooperate with the army. The third indent of Article III led to the creation of the Army of the Vanguard led by the fierce Uruguayan gaucho Venancio Flores, whose function was to hurry ahead through the eastern part of the province of Corrientes, as described in Palleja's diaries. By this article the Allies pledged not to lay down their arms, unless by mutual consent, until they had abolished the López government, nor to treat separately with the enemy. This article has been criticised for making it difficult to negotiate peace. Indeed, after the initial enthusiasm, Argentina had a strong antiwar party and had it not been for Brazil, it is possible that Argentina might have opted to negotiate peace. As foreshadowed in Article 6, this clarified that the enemy the Paraguayan government (i.e., López) rather than the country of Paraguay. Therefore, a volunteer anti-López Paraguayan Legion would be admitted to join the Allies. It has been objected that the Paraguayan Legion were traitors to their country, but there can be no doubt that the López government was a dictatorship with an emigrée opposition. A different objection is that Paraguayan prisoners of war were forced to join the Legion or, at any rate, the Allied armies, which, had it been true, would have been outrageous. This reiterated that the Allies bound themselves to respect the independence and sovereignty of the Paraguayan Republic, because the real enemy was the López regime. Although at the time some objected to this as a cynical manoeuvre, there is really little ground to doubt the sincerity of the Allies' motives on this point. Brazil and Argentina were traditional rivals, and neither wanted the other to absorb Paraguay. A separate complaint was that the Allies did not really mean to respect the territorial integrity of Paraguay, because they meant to help themselves to large portions of Paraguayan territory. However, this objection presupposes that those territories were, in international law, Paraguayan, when in fact they had long been in dispute. No third-party State recognised anyone's claim to those territories; and like considerable parts of South America they were not really occupied by anyone other than aboriginal inhabitants. Brazil and Paraguay had been in dispute about the borders between Paraguay and the Mato Grosso; and large parts of the territories of the Chaco and the Misiones were in dispute between Paraguay and Argentina. Thus the territories were genuinely in dispute, and in the nineteenth century it was not surprising that, if there was to be a war, the victor should occupy territories in dispute as the spoils of victory. Still on the theme that the war was really against the López regime, this article provided that the Allies would collectively guarantee the independence of Paraguay for five years. In nineteenth century international practice a Power that guaranteed the independence of a country was agreeing to protect it by force should it be threatened. Bearing in mind the traditional rivalry and suspicion between Brazil and Argentina, what this signified was that if one threatened Paraguay the other would come to Paraguay's aid. An objection against Article 9 was that the guarantee was only for 5 years, which was practically meaningless since the war lasted for 5 years anyway. However, the Allies were not to know this in 1865. Besides, another interpretation is that the 5 years would begin to run at the conclusion of the war. This interpretation is supported by the words "in conformity with the foregoing article". The foregoing article (article 8) said that "the Paraguayan people may elect their own government and give it any institutions they make fit", which would not have been possible until López's overthrow—i.e., until the end of the war. This article provided that Paraguay would pay an indemnity for the war, which was criticized for being excessively harsh. But at the war's end, Paraguay was in no position to pay any indemnities, which were ultimately cancelled, nothing having been paid. Paraguay successfully argued that if Paraguay had to pay indemnities, it would indicate, contrary to the Allies' claim, that the war was against the nation of Paraguay rather than López, the former president and instigator of the war. By this article the allies agreed the boundaries that would result from their victory in the war. Subject to the later Hayes arbitration (which awarded the Chaco north of the Pilcomayo river to Paraguay), and subject to the territorial dispute between Paraguay and Bolivia (which was resolved by the much later Chaco War), the boundaries are those which exist now. The lower part of the Mato Grosso belongs to Brazil. The provinces of Formosa, Chaco and Misiones belong to Argentina. Note that, by the second indent of this Article, Argentina was supposed to receive territory on the right bank of the River Paraguay (i.e. in the Great Chaco) all the way up to Bahia Negra. That is about 600 km to the north of the present boundary at the Pilcomayo river. For the reasons explained in the second section of this Article, from the moment the Treaty was signed Brazil set out to frustrate Argentina's claim to this territory, and succeeded. For a detailed account see Warren, chapter 10. The treaty was to be secret until its principal object had been fulfilled. Secret treaties, though they went out of fashion after the First World War, and are now regarded as unwise, were commonplace in the nineteenth century. The British consul at Rosario Thomas Hutchinson thought that the "principal object" referred to the demolition of the Fortress of Humaitá, though not mentioned until the Protocol. The Protocol was an appendix to the Treaty signed on the same day, apparently as an afterthought. Article 1 expressly provided that the Fortress of Humaitá must be demolished and that "it shall not be permitted that others of an equal nature should be erected, which might impede the faithful execution of the Treaty". The Protocol also required the disarmament of Paraguay and the sharing of military trophies and booty. Brazil, Argentina and Uruguay signed the Treaty of the Triple Alliance, which committed the three countries to a war to remove Solano López ... The Treaty as published declared that the Allies would respect the independence of Paraguay... The Treaty also contained secret clauses which foresaw fundamental adjustments in Paraguay's borders after the war... Paraguay would be reduced to a quarter of its existing territory." Legally, and by Article 18, all of the clauses of the Treaty were of equally secret status. There were no 'public' vs. 'secret' clauses in the Treaty. All of the clauses the Treaty are set forth verbatim in this Article. There are no others. However some provisions of the Treaty were obvious at the time or easy to guess (e.g., that there was some sort of alliance against López) and others were less so (e.g., the precise extent to which Argentina's territorial claims were to be vindicated). The confusion arose because none of the clauses were open to public inspection, which led to rumours. According to Thompson the main provisions were quickly leaked to the Buenos Aires press. According to Professor Thomas L. Whigham, publication of the detailed text was achieved as follows. The British chargé d'affaires in Montevideo William Garrow Lettsom had asked the Uruguayan foreign minister Carlos de Castro point-blank if the Allies planned to partition Paraguay. With the intention of soothing him de Castro requested discretion and surreptitiously gave him a complete copy of the treaty. But Lettsom was not satisfied: was this confiscation of part of its territory really better than a general annexation? He decided to send a copy to Lord Russell. The British government had for long been opposed to any sort of territorial concessions in Uruguay, and by extension anywhere in the Plate region. The text of the Treaty annoyed Russell and his colleagues who considered it to breach long established diplomatic principles in the region. The British government ignored Lettsom's promises of secrecy and hurried the publication the complete treaty as part of a Blue Book put before Parliament without comment at the beginning of March 1866. The news reached South America some weeks later and created an avalanche of adverse publicity. Bolivia and Peru protested against the treaty and Chile seemed inclined to do the same. On the other hand, when the treaty was published in a Paraguayan weekly, it convinced many people that López was right to wage war with the Allies, and that "Paraguay was compelled to fight for her very existence". Thompson noted that "it gave me a further zest to fight for Paraguay, as I believed, from the terms of the Protocol, that she must either fight or be absorbed". The Allies overthrew the government of Francisco Solano López and razed the Fortress of Humaitá as required by the Protocol. Despite Article XIV's stipulations on indemnities, Paraguay's bankruptcy meant that the expenses of the war were irrecoverable and the demand was eventually dropped. Argentina and Brazil were on the brink of war between 1870 and 1876 due to treaty disputes and misunderstandings. At the end of the war a provisional government was set up in Paraguay under the auspices of the Allies. The country continued to be occupied by Allied troops, chiefly Brazilian. Additionally, Brazilian forces were occupying the Isla del Cerrito, an island near the mouth of the Paraguay River claimed by Argentina, but which had served as Brazil's main naval base during the war. Despite Article VI, which forbade individual countries from negotiating peace treaty, in 1872 Brazil sent Baron Cotegipe to Asunción to negotiate a separate treaty with Paraguay without any explanation to Argentina or Uruguay. This infuriated Argentina, whose foreign minister Carlos Tejedor sent a harshly worded missive excoriating Brazil for trying to negotiate privately with Paraguay. The Buenos Aires press misunderstood and exaggerated the extent of Brazil's breach of faith and said that war with Brazil was the only way of answering it. As a result Argentina took possession of Villa Occidental, a settlement in the Central Chaco to the north of the Pilcomayo River. The Central Chaco was claimed both by Paraguay and Argentina, but was an area given to Argentina by Article XVI of the Treaty of the Triple Alliance. Argentina sent ex-president Bartolomé Mitre to Brazil to help to restore good relations, and by late 1873 tension seemed to be over. However, it was not long before Argentina fortified Martín García Island . The island was a longstanding bone of contention between Argentina, Brazil, and Uruguay, which has sovereignty of the island today. Located in the basin of the Río de la Plata, it could be used to threaten free navigation within the basin. As a result, Brazil reinforced its fleet in the Río de la Plata. Argentina began to acquire war materiel and to buy warships. The American minister in Rio de Janeiro also thought that Argentina was behind an unsuccessful attempt to topple President Jovellanos of Paraguay, whom the Argentines said was a Brazilian puppet . In April 1874, Uruguay, the junior partner in the Alliance, negotiated a separate treaty of friendship with Paraguay under the auspices of Brazil. Argentina broke off diplomatic relations with Uruguay. 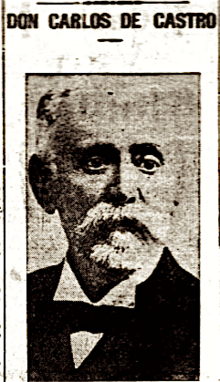 The American minister thought that if war did break out between Argentina and Brazil, Uruguay would be on Brazil's side, and that the Argentine provinces of Corrientes and Entre Ríos (where there was considerable opposition to the government in Buenos Aires, and which in those days were virtually self-governing) would break away; he would not be surprised if, under Brazilian influence, there was formed "a new Riverine Republic … [which] would be composed of Uruguay, Entre Rios, Corrientes and Paraguay" . In 1875, Argentina started fortifying Martín García Island again, which the United States saw as a full treaty violation threatening free navigation. "The problem was compounded by the appearance of two new Argentina ironclads, which caused further Brazilian apprehension and curiosity" . In 1875, the Emperor Dom Pedro II of Brazil decided to try to prevent a war with Argentina, taking up the matter with Carlos Tejedor himself. Matters seemed to be progressing well, when Tejedor suddenly left Brazil. It appeared that Tejedor had been negotiating Argentina's own unilateral treaty with Paraguay, taking advantage of the fact that Paraguayan envoy Jaime Sosa was in Rio de Janeiro at the time. They signed the Tejedor-Sosa treaty, which called for the territory of Villa Occidental to be given to Argentina . This treaty was quickly rejected by the Paraguayan government. It seems that Tejedor and Sosa expected this outcome but that Tejedor signed the treaty anyway to defy Brazil . In the end Brazil and Argentina resolved their differences because "[they] had both learned from past experience that even a successful war would end in national financial disaster". In December 1876 they signed an agreement by which the island of Cerrito was ceded to Argentina, the Chaco south of the Pilcomayo River went to Argentina, the northern Chaco was left to Bolivia, and the Central Chaco was to be arbitrated between Argentina and Paraguay. On January 9, 1872, Paraguay and Brazil was signed a treaty in which Paraguay recognized as debt to Brazil all damages caused to Brazilian people and cities at an interest of 6% with an annual amortization of 1%. Paraguay opened up all of its waterways, the Parana and Uruguay rivers, to Brazilian trade and navigation. Brazil also reserved the right to occupy Paraguay with its imperial army in order to maintain peace and ensure treaty compliance. The national limits between Paraguay and Brazil were established in three different treaties. On the treaty signed on January 9, 1872, the limits were set to be these: the riverbed of the Paraná River from Yguasu's mouth up to Parana's Seven Falls waterfall or Guaira Falls; from the Guaira Falls, by the summit of the Mbaracayu Range and later by Amambay's up to Apa River's source, from where it follows its riverbed down to its mouth on the eastern shore of the Paraguay River. On January 16, 1872, another treaty was signed where the release of all deserters, prisoners and criminals of war was established. Two days later on the 18 a new treaty of Friendship, Commerce and Navigation was signed. By the January 7, 1874, protocol, the Estrella stream was considered the Apa River's source. The last and definite treaty was signed on May 21, 1927, in Rio de Janeiro. A complement to the first treaty, it established that the limit between both countries was the riverbed of the Paraguay river from the mouth of the Apa River with the Paraguay River up to its mouth in Bahia Negra. A treaty of Peace, Commerce and Navigation was signed on December 13, 1873, between Paraguay and Uruguay. As with the Brazilian treaty, Paraguay recognized the expenses, damages and detriments of Uruguayan campaign. Both governments also committed to return all prisoners of war and reopen commerce on the rivers. A Treaty of Peace with Argentina was signed on February 3, 1876, between Paraguay and Argentina. In it, Paraguay recognized all war expenses as well as the damages and detriments caused to Argentine public and private property. The Navigation and transit of the Paraguay, Parana and Uruguay River was also opened. In terms of borders, the main riverbed of the Parana River, from the Yguasy mouth up to its meeting with the Paraguay River; and from the meeting of Paraguay River with Pilcomayo River, following this river's main riverbed leaving thus the Central Chaco region as Argentine territory. The territory between the main Pilcomayo riverbed up to Bahia Negra was divided in two sections, having the first one (from the Verde River – 23° 10' Latitude South) was granted to Paraguay, and the second one was submitted to an arbitrator designed by both governments. The arbitrator chosen by both nations was U.S. President Rutherford B. Hayes, who awarded Central Chaco to Paraguay in 1878, and the Argentine army left Chaco Boreal in May 1879. In gratitude, Paraguay renamed the department as "Presidente Hayes" and the capital as "Villa Hayes". In fact, Asunción even has a soccer team named Club Presidente Hayes. ^ a b Box, p. 269. ^ Schneider 1872, p. 117. ^ Schneider 1902, p.150, n(1). ^ Cautionary note: in 1872 the precocious Zeballos was only 18 years old: Brezzo, 4-5. ^ Correspondence between the Brazilian and Argentine governments, p.11. ^ The diplomatic usage as applied to this Treaty is explained in a note by Paranhos in Schneider, 1902, p. 151. ^ Russell, afterwards Prime Minister, was Bertrand Russell's grandfather. ^ Source: Treaty of Alliance against Paraguay, signed 1 May 1865 between the Plenipotentiaries of Uruguay, Brazil, and the Argentine Republic, printed as part of "Correspondence Respecting Hostilities in the River Plate", taken from the River Plate No.1 (1866), Papers laid before the House of Commons by order of Her Majesty in pursuance of their Address dated March 2, 1866. Bibliographical data: Accounts and Papers": Thirty-Nine Volumes – 38 – State Papers – America (U.S.) – Prussia. Session 1 February – 10 August 1866 – Vol. LXXVI. 1866. Pages 13-17. Google Books|, accessed 10 June 2016. ^ Schneider Appendix, pp. 101-4. ^ Downloadable version at the Internet Archive. ^ The text available on Spanish Wikisource  is not accurate. It lacks the Preambles, for example, and omits the role of Venancio Flores and the Uruguayan forces in Article III. ^ a b c For the sake of clarity, in this Article colons have been used to introduce the plenipotentiaries; in the original translation as laid before the House of Commons, commas were employed, which is somewhat confusing. This is the only change that has been made in the text. ^ Sic in official British translation. In the Brazilian version it is, of course, Sua Magestade. ^ a b c d e f Sic, spelling in original English translation. ^ The proper spelling of his name was Manuel Luís Osório, afterwards Marquês do Herval. ^ The spelling in the Portuguese version of the Treaty is "Mouchez". The reference is to the French hydrographer Ernest Mouchez. ^ Sic: dittography in the original translation. ^ Schneider 1902, p. 153. ^ At least, the Allies collectively. There were currents in Argentina who would indeed have liked to absorb Paraguay, but Brazil was resolutely opposed to this. Her traditional policy in the River Plate was to undermine Argentine hegemony. ^ War indemnities (claimed by Brazil, Argentina and Uruguay, but never paid, and eventually cancelled) should be distinguished from claims by private citizens for damages suffered by them personally during the War. The latter were adjudicated by the Paraguayan-Argentine Mixed Commission and the Paraguayan-Brazilian Mixed Claims Commission, which awarded damages totalling approximately 10 million Swiss francs for Argentine and Brazilian citizens, respectively. Paraguay liquidated these claims by delivering polizas (Paraguayan government bonds) but it is not clear whether these bonds were ever paid: Warren, 138-9. ^ "... which, like the postscript to a lady's letter, seems to contain the pith and marrow of the whole. ^ a b Hutchinson, p. 303. ^ See Lettsom to Russell, May 29, 1865, Hostilities in the River Plate, p.2: "The details of the Treaty are, it is true, not made public as yet, but many persons conceive they know what are its chief provisions". ^ Whigham 2015, locations 1169-1172. ^ a b Strauss, p. 24. ^ In fact, Brazil and Paraguay signed four treaties in 1872 but none of them had any implications for the rights of Argentina; rather they dealt with extradition, commerce, and consular privileges (Strauss, p.25). ^ Cavanaugh, Darien (19 April 2017). "The Paraguayan War was the Dumbest and Costliest Conflict the Americas Ever Experienced". War Is Boring. Retrieved 19 January 2018. Bethell, Leslie (1996). "The Paraguayan War (1864-1870)". London: Institute of Latin American Studies. ISBN 1 900039 08 7. Brazil Ministério das Relaćōes Exteriores (1872). "Correspondence between the Brazilian and Argentine governments respecting the treaties concluded between Brazil and the Republic of Paraguay and the withdrawal of troops from the Island of Atajo". Foreign and Commonwealth Office Collection. The University of Manchester, John Rylands Library. JSTOR 60235190. Brezzo, Liliana M. (1 February 2006). "La guerra del Paraguay a través de la memoria de sus actores: el proyecto historiográfico de Estanislao Zeballos". Nuevo Mundo Mundos Nuevos (en ligne) (in Spanish). Retrieved 13 August 2016. Doratioto, Francisco (2008). Maldita guerra: Nueva historia de la Guerra del Paraguay (in Spanish). Buenos Aires: Emecé Editores. ISBN 978-950-04-2574-2. Lynch, John (1993). "From independence to national organization". In Bethell, Leslie (ed.). Argentina Since Independence. Cambridge University Press. pp. 23–43. ISBN 0-521-43988-4. Hostilities in the River Plate. LXXVI. 1886. , further bibliographic details in note to text. Hudson, Manley O. (April 1925). "The Registration and Publication of Treaties". The American Journal of International Law. The American Society of International Law. 19 (2): 273–292. JSTOR 2189254. Hutchinson, Thomas J. (1868). The Paraná; With Incidents of the Paraguayan War and South American Recollections From 1861 to 1868. London: Edward Stanford. Strauss, Norman T. (1978). "Brazil after the Paraguayan War: Six Years of Conflict, 1870-6". Journal of Latin American Studies. Cambridge University Press. 10 (1): 21–35. JSTOR 155846. Thompson, George (1869). The War In Paraguay: With a Historical Sketch of the Country and Its People and Notes Upon the Military Engineering of the War. London: Longman’s, Green and Co.
Vasconsellos, César A (1931). Los Límites del Paraguay. Asunción: Imprenta Nacional (the Paraguayan State Press). Warren, Harris Gaylord; Warren, Katherine F. (1985). Rebirth of the Paraguayan Republic: The First Colorado Era, 1878-1904. Pittsburgh, PA: University of Pittsburgh Press. ISBN 0-8229-3507-4. Whigham, Thomas L. (2002). The Paraguayan War, Volume 1, Causes and Conflict. Lincoln and London: University of Nebraska Press. ISBN 0-8032-4786-9. Zeballos, Estanislao (1872). El Tratado de Alianza: Exposición Hecha en la Universidad de Buenos Aires el 30 de Agosto de 1872 (in Spanish). Buenos Aires: Imprenta de Jorge E. Cook. This page was last edited on 11 January 2019, at 07:37 (UTC).